1. Wash the rice and soak it in cold water for 15 to 20 minutes. 3. Fry the onions till lightly browned. 4. Add the garlic, chilli and ginger. 6. Add the chicken and fry for 3 to 4 minutes. 7. Now add the curry paste, salt and garam masala powder. 8. Cook for 4 to 5 minutes before adding the tomatoes. 9. Cook for another 2 minutes and remove from heat. 11. Drain the rice and add to a large pan of water. 12. Add turmeric powder and bring to a boil. 13. Cook for about 5 to 8 minutes or till the rice is almost ready. 14. Drain the rice and add bay leaves, cardamoms, saffron and cloves. 15. Place the cooked rice as the first layer in a shallow, ovenproof dish. 16. Then add the chicken mixture followed by a layer of rice. 17. Repeat until all the mixture has been used, finishing off with a layer of rice on top. 18. Cover with a lid and bake in a preheated oven at 190C/375F for 10 to 15 minutes or until the chicken is ready. 19. Transfer to serving plates. 20. 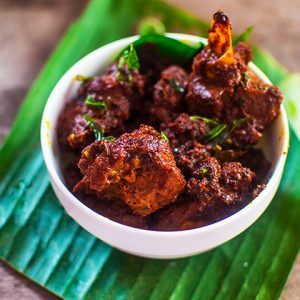 Serve hot with chutney of choice. 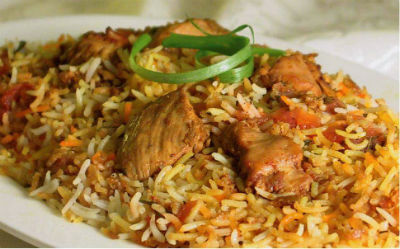 Feel free to comment or share your thoughts on this Goan Chicken Biryani Recipe from Awesome Cuisine.